R to L (Japanese Style)As part of the celebrations for its 100th anniversary, the publishers of the Tozai News have decided to commission the creation of the 'Ultimate Menu," a model meal embodying the pinnacle of Japanese cuisine. This all-important task has been entrusted to journalist Shiro Yamaoka, an inveterate cynic who possesses no initiative, but does have an incredibly refined palate and an encyclopedic knowledge of food.Each volume of Oishinbo follows Yamaoka and his colleagues through another adventure on their quest for the Ultimate Menu. Now, the best stories from the hundred-plus volume series have been selected and compiled into A la Carte editions, arranged by subject.In this volume, the focus shifts from food to drink--specifically, to sake. 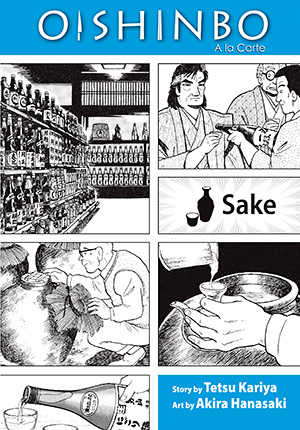 For centuries different types of sake have played the same roles in Japan as wine and beer have in the West, from inexpensive everyday drink to refined single-batch rarities. Above all, sake has been enjoyed as an accompaniment to a meal, and after a revelatory moment at a local pub, Yamaoka decides that drink pairings must be an integral part of the Ultimate Menu. So which foods go best with which drinks? Sit down, pour yourself a glass, and read on!